A change was made in the rulebook regarding year end high point awards. 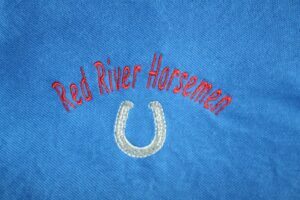 In the past we recognized the high point horse/rider team and the high point rider in each division. In most cases the same rider won both high point awards in their division. It was decided to drop the high point rider award. For 2014 AHCA will recognize the top ten horse/rider teams in each division. AHCA will again host a pizza party at the Nationals to recognize the high point recipients.. To accomplish this we need to have all 2014 challenges completed and results submitted by Oct 6. Memberships must be current and all horses must be registered to be eligible for year-end awards. We are very pleased to announce our partnership with Montana Silversmith. MSS has an excellent reputation in the industry for quality of workmanship and dependability. We are in the process of setting up a store on the website. In the meantime, if you need to order any silver products contact the AHCA office or pm Rhonda Miller-Lebbin. MSS is the only buckle maker authorized to use the AHCA logo. Buckles must be ordered through AHCA. We are very excited to have Montana Silversmith as a sponsor for the 2014 National Finals buckles. Welcome to a new affiliate – Wind Valley Equestrian. Nina Kowalski is the affiliate organizer. Wind Valley Equestrian is located in Swartz Creek, MI. Watch the events page for upcoming challenges. All hook-ups are power only or primitive camping. A few outdoor pens are available. RESERVATIONS are necessary. Pen’s are $10.00 a night. Power only hook-up is $20.00 a night. These fee’s are payable to Janice Early. Parking will be in a pasture. Judge’s Clinic to follow challenge. Contact Martha Macdonald mjewelmac@aol.com for registration. Come hang out and have a blast. Get qualified for the AHCA worlds or just try it out as a non member. Other than our partner club, Cheyenne Country there is nowhere around here you can truly experience this sport. Safe, fun, divisions for every age and skill level, affordable and best sportsmanship in the world. Come be a spectator – its free to watch and you can see all the action. We make every rider feel great with cheering and encouragement. If you haven’t been to the 10BUCK2 Ranch come give us a try cause we work hard to make great memories, not just get your money.